Sunday was a special day for online audiences as Harrison Ford joined the long list of Reddit AMA conversationists. 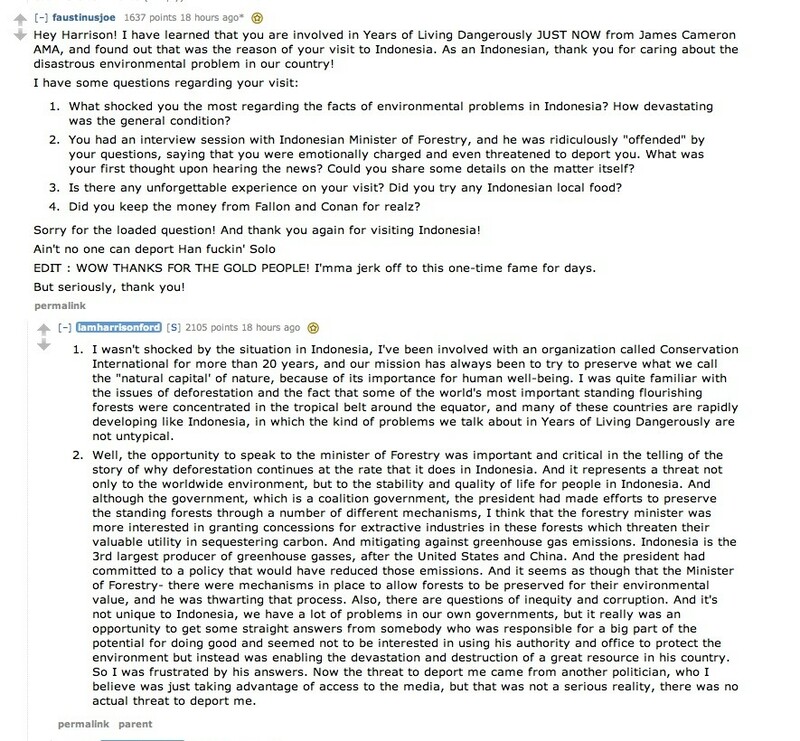 Although he was bombarded with the usual questions on his infamous roles of Han Solo, Indiana Jones, and even Rick Deckard (Blade Runner), there were a few hidden gems that touched base on Harrison Ford’s humanitarian work, being that he’s been a board member of the organization Conservation International for over 20 years. Here’s some lesser known highlights of the legendary actor and some hope for humanity. Years of Living Dangerously is a powerful docuseries that just premiered on Showtime. The full episode is currently available to watch online. Check it below. In true Reddit fashion, most questions are fun and games, but Harrison Ford isn’t one for hokey religions and ancient card tricks. You can check out the rest of the question and answers over at Reddit. FIRST woot!! What an awesome experience to chat with Harrison Ford!! Wish I caught it in time. I'll check out the "years of living" show. Thanks for a great article!! Much appreciated! Glad you enjoyed the article.